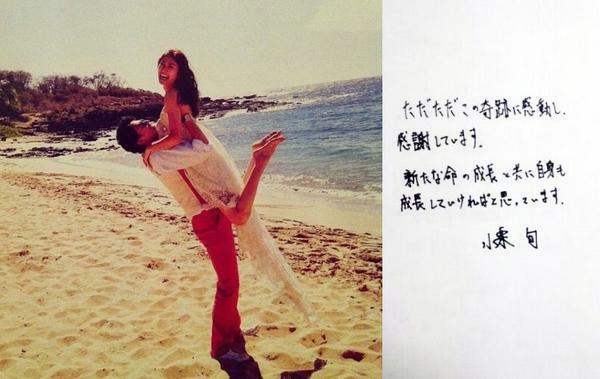 Back in October reports came out that Yu Yamada had finally given birth with her husband Shun Oguri. Initially details were sparse, the couple chose to not reveal the baby’s birthday or even it’s gender much to the disappointment of the media and fans alike. Rumors floated around that the couple gave birth to a baby girl but it was never confirmed. 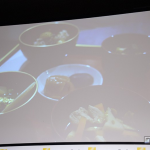 However, at a recent press conference for the Nikon Family D5500 camera Shun Oguri had a special treat for the guests. Shun shared two private photos taken with his Nikon D5500. In the first shot we’re introduced to his baby girl, with a touching photo of her holding his hand. Shun expressed excitement at being able to capture her day-to-day changes as she grows. The second photo is an appetizing home cooked meal prepared by Yu Yamada. Shun joked that he was so focused on feeding his daughter, that he actually ended up eating lightly that night. 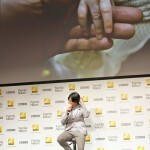 Shun will also be starring in a CM for the Nikon Family D5500 where he plays a father of two. Seeing his relaxed natural behavior with his younger co-stars, as well as hearing stories from his new family truly gives Shun the image of an “ideal father”. Fans were in for another treat when Yu Yamada shared a surprise selfie with her daughter. Most of her face is covered for privacy but the picture is still cute as ever! The picture, along with photos from the press conference and behind the scenes footage from Shun’s new CM can be seen below!